Three new landmark signs, plus one installed near Aldie in 2012, reflect many years of behind-the-scenes work by community leaders. The large, die-cast aluminum signs, readable from a car or on foot --perform well in transmitting a lot of history quickly. The new signs are part of a restoration trend that is beginning to re-define Bluemont and shape it again into a Western Loudoun visitors’ destination. The establishment of the Bluemont Mill and Train Station on Railroad Street a few years ago, plus the ongoing projects to restore the E.E. Lake Store and the Snickersville Academy for public use embody this trend. 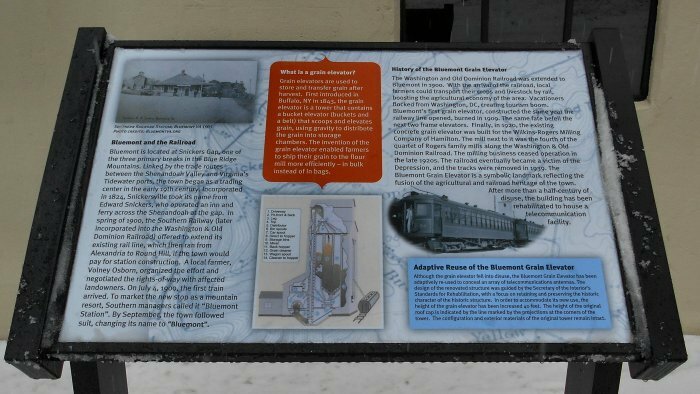 One of the new historical markers sits at the base of the Bluemont Mill and Train Station , where proprieter Rosemary Stanger has established a museum and crafts store. The other two greet visitors entering Bluemont at the bottom of Clayton Hall Road. The smaller Virginia historical designation sign, put up in the 1980s, remains at this historic corner as well. 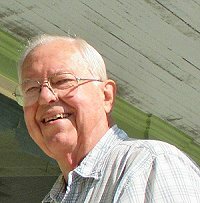 Tim Dennis of Global Towers Partners -- who first envisioned and ultimately built the 40-foot upward extension on the grain elevator/mill to house the workings of an internet and cell phone tower -- put up the marker in 2013. This adaptive re-use of a once state-of-the-art, fire-resistant concrete grain elevator at a railway stop has now become the first geothermal cooled cell tower site in the United States. In the following photos, Shirley Russell, cashier at the next-door Bluemont Store, braves the snowy February morning to show off the new twin signs on Snickersville Turnpike at the corner of Clayton Hall Road. The Snickersville Turnpike Association erected thesigns (written in lively style, thanks to Marvin Watts). Debbie Allan designed the toll turnstile and buggy logo. The signs were purchased by grants from the Loudoun Preservation Society and the Bluemont Citizens Association. 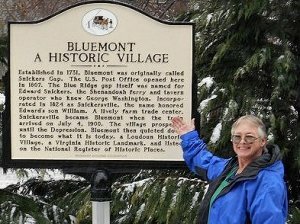 Shirley Russell takes a short break from cashiering to show off the new historical markers that now stand next door to the Bluemont General Store. Beginning July 4, 1900 visitors rode the W&OD train (nicknamed the “Virginia Creeper”) from the Washington DC area to “Bluemont Station” at the foot of the Blue Ridge -- to vacation away from the extreme summer heat and humidity of the Capital City. The Snickersville Turnpike itself is a historic roadway, built in 1786 and praised by Thomas Jefferson as an exemplary public work. The signage on the Pike owes its being to the imagination, dedication, and perseverence of long-time Bluemonter Henry Plaster (left), president of the Snickersville Turnpike Association (SCA). To date, SCA has procured, installed, and written the text for four historical markers on the Pike. One is located near Middleburg and Aldie, another at Hibbs Bridge, and now the two in Bluemont village (pictured above). 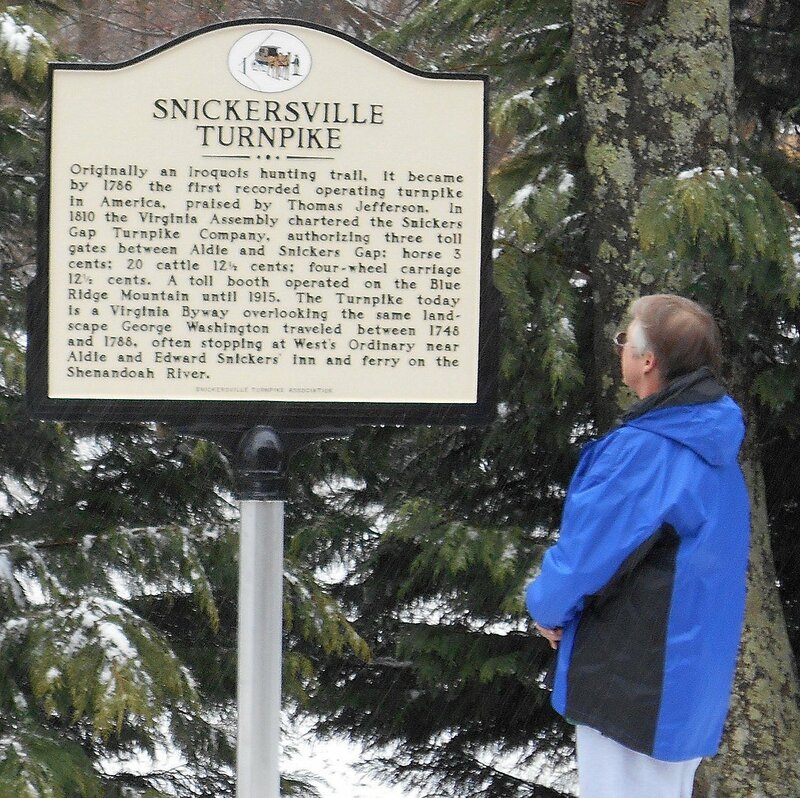 Bluemont's new Snickersville Turnpike marker is a double of one placed near Aldie and Middleburg. The addition of the new sign in Bluemont forms a sort of parenthesis around the southeast and northwest ends of the historic Snickersville Turnpike. Two years ago, the Loudoun Preservation Society funded the marker at Hibbs Bridge (which had been earlier protected and restored by the Snickersville Turnpike Association), about 9 miles southeast of Bluemont on the Pike. 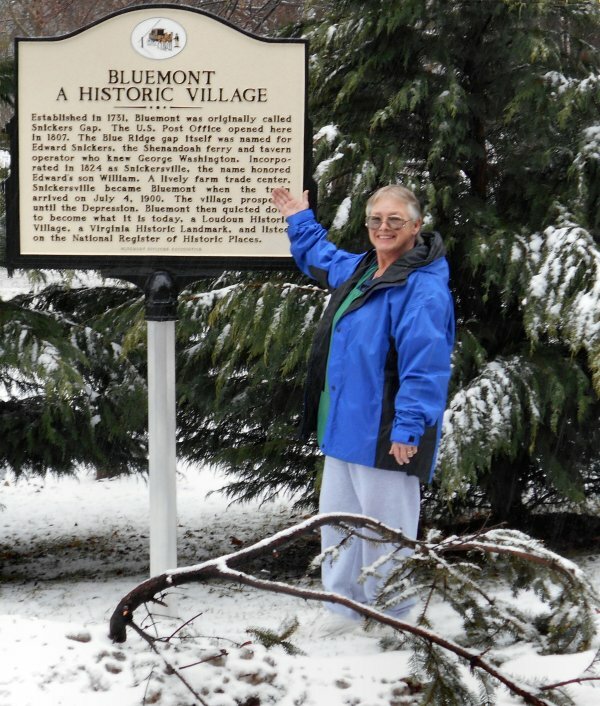 The Bluemont Citizens Association funded the “Bluemont a Historical Village” marker last year. STA funded the remaining two new signs on the Pike. SCA is now requesting LPS grant funding for two additional markers: one at Bacon Fort and the other at White Pump Drovers Tavern, according to Henry Plaster.